Sediuk has a history of confronting celebrities at red carpet events. In 2012, he was slapped by actor Will Smith after he attempted to kiss Smith during a movie premiere. Only recently at the Cannes premiere of "How to Train Your Dragon 2" Sediuk was put his head up America Ferrara's dress hoping to break through security to get into the premiere. In the past he's hugged actors Leonardo DiCaprio and Bradley Cooper around the knees at separate events. 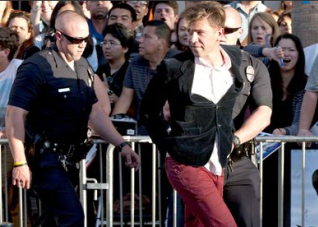 Sediuk was held by security guards and then taken away by officers from the Los Angeles Police Department to the nearby Hollywood police station. He is likely to be charged with misdemeanor battery. 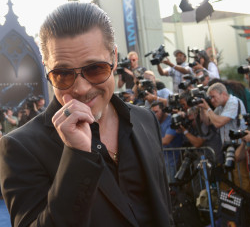 Pitt was said to be unharmed and continued to sign autographs.